EFFECTIVENESS, COST IMPROVEMENT, SECURITY: OUR AUTOCLAVES WILL IMPRESS YOU! Sterilization quality is always an essential requirement for all markets. But it is a primary consideration in the pharmaceutical industry ! Bandages, perfusions, parenteral nutrition, and injectable fluids, intravenous, ophthalmic, or inhalable solutions …: all these drugs or devices must be treated according to the stringent requirements of European and International Standards for sterilization of packaged pharmaceutical products (FDA CFR21 and cGMP, GAMP5). 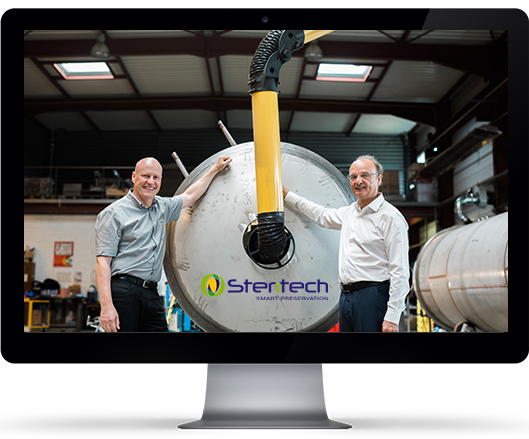 STERITECH autoclaves with Steam/Air process not only meet strictly all the standards of this demanding market, but they also provide greater flexibility of operation, which makes them more effective, less costly and safer than competitors’ similar equipment. And this, regardless of the type of packaging used (flexible pouches, bottles, syringes, and plastic or glass ampoules). They also provide perfect traceability of your manufacturing operations. STERITECH intelligent back-pressure associated with our exclusive agitation “Rocking System” will enable you to achieve the required sterility values faster, constantly and homogeneously while preserving the qualities of your products and the integrity of their packaging. STERITECH CONTINUOUS STERILIZATION SYSTEMS : WHEN QUALITY AND HIGH RATE OF OUTPUT GO HAND IN HAND ! Well established specialist of all types of thermal sterilization solutions for many years, STERITECH offers as well continuous systems for the pharmaceutical industry. As for its autoclaves, the “Serial Tower” and “CHS” systems meet the stringent requirements of European and International Standards for sterilization of packaged pharmaceutical products. These continuous systems enable you to sterilize large volumes in full safety conditions, regardless of the type of packaging used, and with perfect traceability. These are major assets for any general manufacturer, with top productivity track record! Inquire without further delay !